The holes are angled on the rev D vrod cap. I've updated the listing. 1-hole Angled carb cap order placed!!! EDIT: I wonder if i should have gone for the 2 hole version? graydeh1, BornAgainSteama, pxl_jockey and 2 others like this. Zangano Cruel Yerbasseur Grouch. PDX420. Giggler Anonymous. VAPEHUNTER, Ville23, newvape918 and 9 others like this. How much "warm up" time should I give my V-Rod? Any thoughts on this? If I'm using it with flower how much will extra time help? How about concentrates. Shatter? Rosin? I haven't been giving mine all that much time to warm up and it still seems to be effective. Still can't get over the efficiency of this vape. Once I got my inhaling technique down I started getting hard hits with just a pinch of flower. Zangano Cruel, VaporWare and BigJr48 like this. The controller is actually set up to overshoot the programmed temperature and then it eventually settles to the desired temperature. The only reason for this is so it gets there quickly. I would say around 5 mins or so, but keep an eye on it and you'll see what i mean. Hogni, BigJr48, Zangano Cruel and 1 other person like this. Guys what is the point of getting the 710 coils? Are they better than the stock coils that come with the FP? 710Coils and BigJr48 like this. I wish I bought my vrod sooner, I think it might be the last home vape I buy. VaporWare, Roth, Ville23 and 5 others like this. Mr. Gweilo 420, VaporWare, Roth and 6 others like this. Support Shane if you like quality. You will not regret your purchase. I only wish he had come out with this venture sooner. Would've saved me a lot of cash. I just picked up another of his coils in 20mm to go with my FP Wrap around. Mr. Gweilo 420, Roth, 710Coils and 3 others like this. Yes, Shane of @710Coils is a remarkably nice duce who is offering the highest quality products for the lowest price to make it worth his while, which is unbeatable for the quality of his priducts and services. But feel free to correct me here- is the main advantage to the 710 Vrod coil not- that it will work with different, standard XLR controller connections? So that people can use the Vrod with their own, non-Newvape controller with a perfectly fitting Vrod coil, which would otherwise only be available from Newvape and would only work with the Newvape wired controller? Without an adapter cable at least. Or did I get ths wrong? Hogni, YaMon, TheJackofAss and 7 others like this. I think you got it right @Alexis . He is still working on fine tuning his coils to VROD spec I believe. His products keep getting better. The ability to not be locked into the NV ecosystem of controller and coils is a big plus for me. Oogendoogan, Roth, 710Coils and 5 others like this. Yup. I sent him my VROD and coil so he can properly spec it out. Shane is a super stand up guy that helped me with stuff before he even became 710coils. He used to be "just"another one of FCs great members. The artist formerly known as mutten840. looney2nz, Oogendoogan, Roth and 4 others like this. YaMon, TheJackofAss, newvape918 and 3 others like this. I'm curious why nobody suggests the reverse post vrod for use with standard coils? NV coils for the VROD are 15.71mm tall, and VROD coils, regardless of wrap direction need to be 15-17mm tall. There are a lot of coils out there that dont fall into those specs which is where the problem lies. SH coil height isnt really an issue there are enough threads you could probably run a 17 or 18mm tall coil down to maybe 10mm tall it would probably still work without needing to adjust temp too much. Manity, Hogni, YaMon and 2 others like this. 12mm tall coils are for SH and WA. BigJr48 and newvape918 like this. Ah, Shane...I think you have that backwards. SH takes a regular 20 mm coil. Vrod coil from NV is 17 mm tall in addition to being direction of coil specific (though, they make versions for both directions). I'm just going off of the coil info @NewVape710 laid out in the above post. 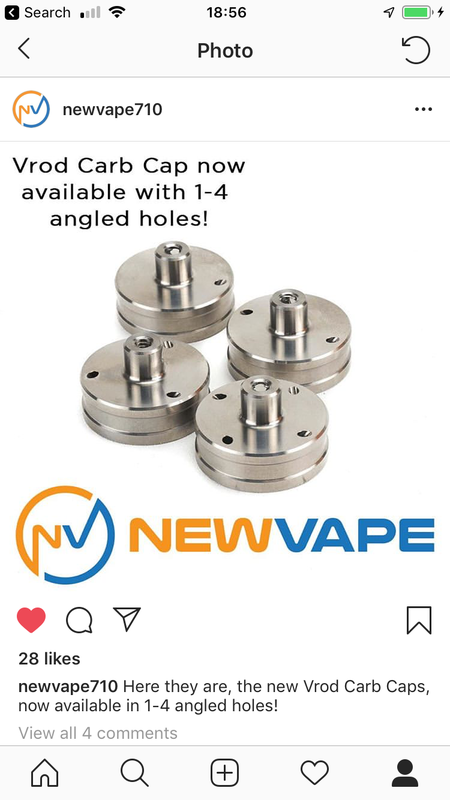 I dont quite understand....if it's no less than 17mm for VROD coils then why is the one NV posted 15.71mm while saying it needs to be 15-17mm. I have a hard time believing the owner/machinist did not show the right coil specs. Not sure what post you are referring to but let me try and clarify this for you. The showerhead is definitely more forgiving when it comes to how tall your coil is. The Vrod is not, now that doesnt mean you cant use something less than 17mm, what it means is that the tighter the tolerance is, the more efficient it is. You def cant go above 17mm. Ideally, stay between 15 and 17mm. Hogni, Stripzest, Zangano Cruel and 5 others like this. Thank you for confirming what I was saying. I'm referring to the post I linked above from page 500 where your co-worker posted pictures of coil specs for the VROD and had said 15-17mm tall coils were needed and showed a caliper on a NV coil. Idk if I was misunderstanding @Zangano Cruel above but it sounded like they were saying 17mm+ will only work. Which you just confirmed 17+mm will not work. To me this was pretty simple...saw the specs, found something within the specs and bought 4 hope to be good for a while. Zangano Cruel, newvape918 and BigJr48 like this. JCat, VAPEHUNTER, newvape918 and 9 others like this. They should make some plugs so I could buy a 4 holer and make it any combination of holes by plugging and unplugging. Manity, Zangano Cruel, Roth and 3 others like this. Also now available through NewVape. Manity, BigJr48, Zangano Cruel and 3 others like this. They still are making a version just like that. Believe they're calling it the "baller cap" if I'm not mistaken. They posted about it a few pages back I believe. Really glad to see the angled carb caps coming out, looking forward to hearing some reviews. I will probably pick one up during a Black Friday sale. BigJr48, Zangano Cruel, graydeh1 and 1 other person like this. I'll grab one of those baller caps on Black Friday as well and some of these pearls. BigJr48, BornAgainSteama and invertedisdead like this.